Here is a new offer from Smart Communications that will boost your internet surfing experience at home. 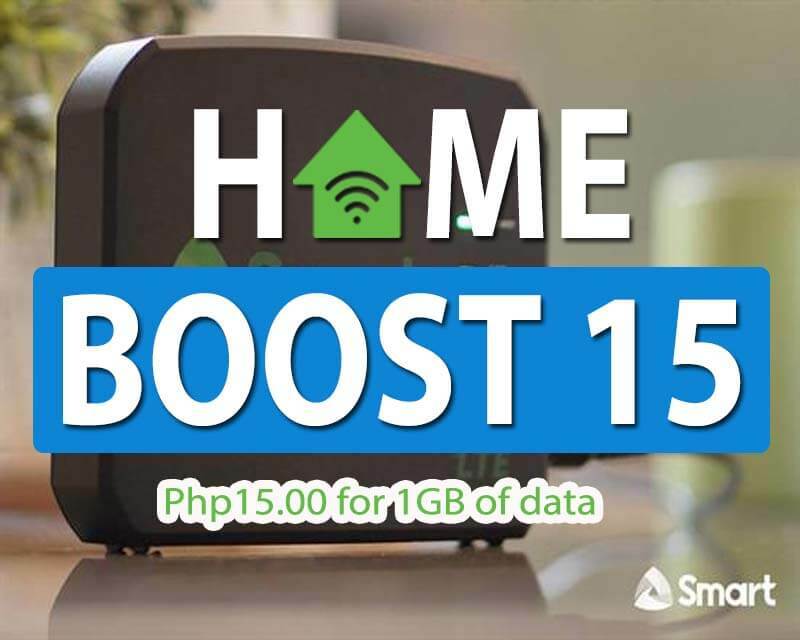 The Smart Bro prepaid Home Boost 15 promo gives you 1GB of data for only 15 pesos to one-day validity. Yes, you read it right Php15.00 for 1GB, but the twist is you can only avail it on top of Giga Surf, SurfMaxPlus and Home Boost 50 or higher. It is an add-on or a top up that you can purchase at a very affordable price when you almost running of data. This is very similar to Globe HomeSurf 15 that you can also purchase on top of GoSURF50. Smart created this promo to counter the offer and to give their subscribers an easy option to add up more data at cheaper price. For now, you can only subscribe to this promo via SMS keyword. You also need to have an active subscription to Gigasurf, SurfMaxPlus and Home Boost with at least 250MB of remaining data for you to top up BOOST15. Before you start using the promo, make sure you receive the SMS notification from Smart that says your Home Boost 15 subscription is already active and ready to use. Just go to your Smart Bro dashboard to check the device inbox. You can also check out other denominations of Smart Home Surf promo from 50 to 599 pesos. You can text the keyword BAL to 9999 or you can also use your dashboard to check the status of your BOOST15 promo. What you can do with 1GB data? You can download large file, watch videos, access your social media account (Facebook, Twitter, Instagram etc. ), stream music (Spinnr, Spotify etc. ), access email and other online activities.